The Smok TFV4 Tank has been making waves because all of it’s advanced sub-ohm tank technology. Not only does it have a hinged top cap for easy refilling along with dual adjustable airflow, but it has four different replacement head options, including rebuildable single and dual coil heads, and patented triple (TF-T3) and quadruple (TF-Q4) replacement coils. 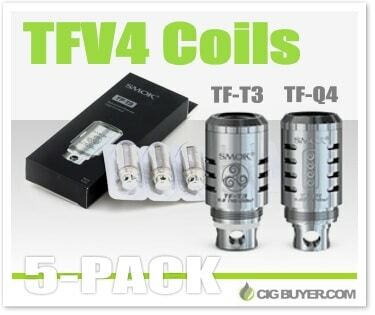 If you’re looking for massive clouds, the triple and quad heads are certainly the best way to go, and they’re also the most popular option for the TFV4. * PLEASE NOTE: You can save even more when you buy multiple 5-packs!